[miau] Football, also known as soccer, is a wildly popular sport. Now you can play without the injuries, or the sore muscles. You don’t even have to put on a jersey or a pair of cleats anymore. With Football Star Slots you can be a football star with just the push of a button. The fast pace and colorful graphics will be just as exhilarating as if you were really out there on the field. The slot play is just as thrilling as if you were in a Vegas casino! Football Star Slots displays familiar symbols associated with football. These include but are not limited to, cleats, jerseys, and players. The colors are displayed in a variety of colors and models. All of them are eye-catching and add to the excitement. Pretty much every facet of football is covered in Football Star Slots. The game really just keeps getting better. The game includes the thrilling 243 Ways to Win element. This helps avoid any frustration when you get winning combinations on neighboring pay-lines, but they didn’t fall on a pay line. The 243 Ways to Win feature eliminates this frustration completely. It also eliminates the need to set the number of pay-lines you want to play, letting you play with just the click of a single button. Football Star Slots offers numerous features. There is a feature called, Striking Wild. This aspect triggers randomly during play. When the feature is activated either the second, third or fourth reels can turn wild. When this turns on, all positions in the reel become wild. This substitution makes many more winning combinations possible. It is one of the more exciting features out there today. Especially when activated a football star steps out and kicks a hard shot, turning the random reel into the wild reel. Another one of the wild features is, Stacked Wild. This is another helpful and exciting aspect in the game. When the Stacked Wild feature is activated, a wild symbol will substitute for another symbol. This does not include the scatter Ball. The stacked logo is stacked on reels 3, 4 and 5. This gives you more opportunities for wins. These are all great ways to get the crowd roaring with excitement for this exciting football game. Nothing gets the crowd going more than free spins. The way to get free spins, is when three or more Football Scatters appear anywhere across the reels. These can be scattered about anywhere across the slot screen in the reels. Indication of the number of free spins is determined by the number of Football Scatters symbols. The Free Spin feature also has an add-on feature. There is a multiplier that increases every time the Rolling Reels win. With this it is possible that the multiplier could reach a value of 10. This multiplies your standard payout times 10. Not much could be much more exciting then a 10 times multiplier. Overall Football Star Slot is a thrilling game. It holds so many aspects of football it is really appealing to any sports fan, and most especially football fans. It has just enough suspense, and plenty of add-on features, to keep the play captivating. 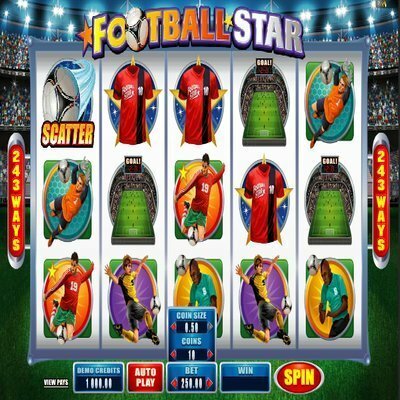 Any one looking for a fun and exciting slot game, would not be disappointed with Football Star Slot.